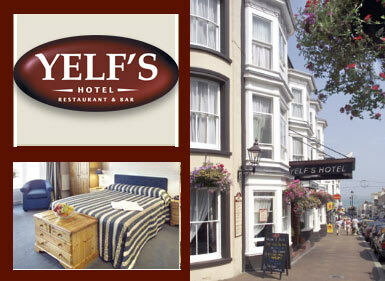 Yelf´s Hotel is one of the best known Isle of Wight hotels and is located in the popular town of Ryde - ´The Gateway to the Isle of Wight´. It is open all year round, including Christmas and offers quality accommodation to holiday and business visitors, from single rooms and suites to self-catering accommodation. The hotel is one of the oldest original coaching inns on the Island and has been carefully refurbished to retain much of its charm and atmosphere. All 40 rooms at this delightful, historic Isle of Wight hotel have been recently refurbished, and many have wonderful views across Ryde and the Solent. The rooms, which range from singles to suites and four-bedded rooms accommodate all our guests´ needs. All bedrooms are superbly appointed and include en-suite facilities, colour television with Sky TV, radio, direct dial telephone, hairdryer and courtesy tea and coffee making facilities. Bromley House is a newly opened addition to Yelf´s Hotel with nine excellent rooms for those looking for self-catering accommodation. Each room is self-contained with kitchen and bathroom, and we have a fully equipped room for the disabled and a lift to the first floor. Bromley House also has off-road car parking for 20 vehicles. Enjoy the comfort and luxury of our newly extended, air conditioned Restaurant and Lounge, offering a variety of dishes for lunch and dinner, as well as traditional Roast Sunday Lunches. There is also an excellent coffee shop menu with a wide choice of homemade cakes plus a selection of Chef´s Specials. Our stylish Patio Beer Garden and Conservatory are the perfect places for relaxing over fine food and drink at any time of the year. All our food is freshly cooked using the finest local ingredients and every meal, from dinners to light snacks, is complemented by a large selection of quality wines and beers. Yelf´s Hotel provides an excellent base for the business traveller and we have an excellent range of function rooms, which provide a variety of sizes for different conference, seminar and meeting applications. We cater for all occasions and can accommodate parties of up to 100 plus in our restaurant. We pride ourselves in making every occasion meet your individual needs, with a range of prices to suit every pocket, so please contact us to discuss your exact requirements.